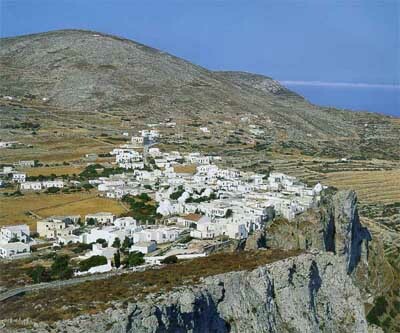 Folegandros Island, Cyclades Islands, Hotel Reservations, Discount Hotels. Your port of arrival is Karavostasis and unfortunately its name is more inspiring than the place itself. However, after undertaking a short bus journey, you alight in the cliff-top village of Hora, a completely different world. It is no exaggeration to describe Hora as one of the most beautiful, traditional villages of its kind. From the delightful shaded square outside the main gate, narrow alleyways lead to the inner precinct, an extraordinary square, borded on three sides by the backs of houses, the fourth a cavernous drop 700 feet to the sea with views that almost match famous Santorini. Hora is peaceful and quite up-market with tavernas and cafes to match. A road stretches northwards from Hora, hugging the cliff-top and offering more breathtaking views before descending sharply to Vathi Bay where you can relax on a lovely, sandy beach. History: The southernmost island of the Western Cyclades. lt lies between Sikinos and Milos. The mariners call it Poucandros. lt is an island full of mountains and sheer shores. It is separated in two parts by the gulfs Porto Vathy and Plaka. The Mythology reports that the island was colonized by the Cretans with Folegandros, the leader, son of Minos. ln 425 the unification of the island with the Athenian alliance. The Romans are included to the conquerors of the island, which they used as a place of exile. 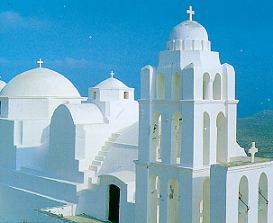 It had been a part of the Duchy of Naxos for 400 years (1207-1607). Then the occupation by the Turks came until the Revolution in 1821.